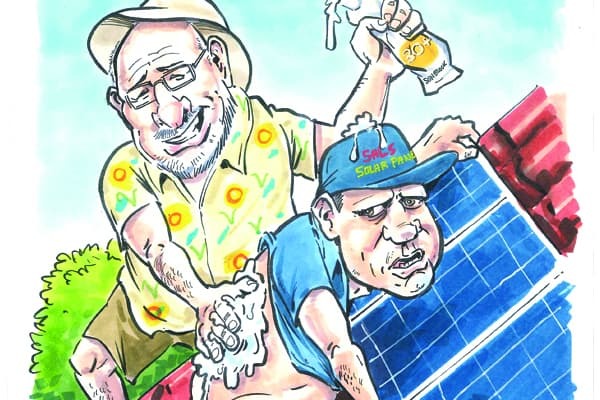 Think about solar installations the same way you think about sunscreen, writes Gary Busbridge. Simply buy quality products. It’s that time of year – out comes the sun, off comes the shirt, suntan central. But there are hazards associated with getting that suntan, and we all know that we should ‘slip, slop and slap’ as a matter of course. That is, slip on a shirt, slop on the 30+ sunscreen and slap on a hat. You could take it further with: seek shade or shelter and slide on some sunnies. ‘Slip, slop, slap, seek and slide’ is very good advice for all tradies. But this article is not just aimed at helping you to be sun-smart. The solar energy revolution has been under way for quite a few years. By the end of 2014, government support had led to the installation of about 1.5 million small-scale solar power systems across the country. According to the Clean Energy Council, these systems produced about 2% of the country’s total electricity, and the figures can only have increased through 2015. Although this has been a boon for clean energy production, it has been far from smooth from an installation perspective. First, there were the more than dubious installations using various government rebates to provide ultra-low-cost systems to the home owner. This was devastating for the reputable electrical contractor who wanted to provide a quality installation with quality components. Basically, the bad guys cut out any reputable contractor because of price. Fortunately, things have calmed down and there are many who now provide that system at an effective price, using quality products. There were lots of horror stories of poor workmanship and lack of service back-up. If something went wrong, home owners ended up wih no support whatsoever – they were probably left with just a phone number. Most of the cowboys have now left the market. The AS/NZS 5033 Photovoltaic Installations Standard has been published for quite a while, and in recent times the AS/NZS 4777 Standards for Inverters and Inverter Installations (Part 1 and Part 2) have been published. From a Standards perspective things are all tickety-boo … or are they? Among the problems that have arisen, by far the worst is the number of fires caused by the DC solar isolator switches, whether on the roof or on the wall near the inverter. The regulator in Queensland has done extensive work in the field to check installations, and staff were horrified by the number of dubious quality DC solar isolators in the systems. Some brands that caused fires have been recalled, and you may have seen the notices. These brands were of poor quality with ineffective switching contacts, which would not have survived the performance requirements of a DC isolator Standard in any shape or form. Given the evidence gathered by the Queensland regulator, it’s hardly surprising that there’s a bit of work to do in tidying up the loose ends. A recently updated international Standard for DC isolators is being adopted in Australia as AS/NZS 60947-3. It’s highly likely that the DC solar isolator will be called up in legislation as a ‘Level 3 or declared article’. Before being sold in Australia, these items will have to show compliance to the Standard and be marked with the Regulatory Compliance Mark (an approved product). It is most important to remember that the current AS/NZS 60947-3 Standard for DC isolators is robust and provides the necessary performance and verification detail for these types of switches if applied appropriately. However, it needs further environmental considerations specifically related to Australian and New Zealand requirements. Some of the detail now being considered should help with your selection, so the following should be considered as a requirement before buying solar isolators. First, look for the marking, and by this I mean the label. It should preferably be on the front of the cover so that it can be easily seen after installation. The essential information is the trade name, the catalogue number, the IP rating (eg: IP56), DC-PV2 classification, the rated current of the switch in the enclosure, the AS/NZS 60947-3 Standard number and the mounting orientation. For your information the DC-PV2 is described as: connecting and disconnecting PV circuits where significant over-currents may prevail and where current flow can be in both directions; for example, where several strings are connected in parallel and to the same inverter, or one or more strings with a battery. Second, the product should carry the manufacturer’s instructions for the installer. The information should contain details of installation requirements for the IP56 outdoor units, and an indoor unit where it is not exposed to weather. There should also be some derating factors for the rated current based on the ambient temperatures where the unit will be installed. This may affect the ratings of the solar installations. The cross-sectional size and the number of cables accepted into terminals along with specific torque ratings on the terminals are also expected to be on the instructions. Third, there are some physical performance issues to look for. The operating method of the switch should be independent, meaning that the user has no control of the switching action within, even though the user operates the switch. The switches shall also be suitable for isolation purposes and able to be locked in the ‘off’ position. Fourth, and this is an important aspect of the installation, you must deal with the effects of moisture ingress in the enclosure. Think about how the conduit is fitted to the enclosure, as heating and cooling during the day and night does cause some condensation in the enclosure. To this end, have all conduit entries to the bottom face of the enclosure so that any condensation build-up will drain into the conduit. This has been standard practice for many a year among sparkies installing in harsh environments. If you want to be sure, drainage glands can be fitted to the enclosure that will allow drainage but won’t compromise the IP56 rating. The trick is to buy reputable products for your installations – just like using a reputable sunscreen to protect your skin.